Learn to play the world’s greatest card game! Share the pleasure of knitting, crocheting, etc. and help others with a project or pattern. Can’t knit? We can teach you! Every level welcome. No reservation necessary. No cost. Meet monthly for discussions and fun extracurricular activities. Adult men welcome. Bill Adler leads a stimulating discussion each month on the events of the week. Bring your ideas to share with the group. All-new program format! A Co-Production with A/C Theatre Company Viciously funny and devastatingly heartbreaking, Hedwig and the Angry Inch is a modern masterpiece! With an electrifying glam-rock score and high-voltage performances, this show is thrillingly progressive and thoroughly entertaining! Japanese Moonviewing Festival (Fri-Sat Oct. 6-7). 6-9pm. $25 ($20 members), $5 ages 3-12, under 3 free. Live entertainment, beer garden, telescope viewing and more. Japanese Friendship Garden of Phoenix, 1125 N. Third Ave., Phoenix. japanesefriendshipgarden.org. Families, join us as we celebrate the joyous holidays of Sukkot and Simchat Torah. There will be fun activities, crafts, stories and more. Free for our ECC families, but registration required. Guests: $5 per child. 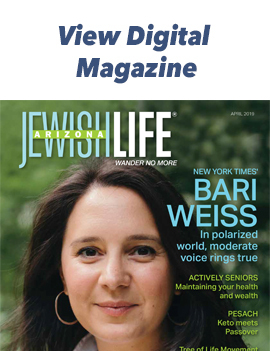 Come join Smile on Seniors of Arizona in our large Sukkah (hut), and celebrate with friends and family! Enjoy snacks and the opportunity to fulfill the special mitzvoth performed on the Sukkot holiday… SHAKE…SHAKE…SHAKE!!! Join us for a beautiful yoga practice as we enjoy the Arizona sunrise. Class is held outside. Dress appropriately and bring water. Meet an author who is either from Arizona, resides in Arizona, or uses Arizona as a locale for their books. Register with Merrill. Gather together with Rabbi Levi Levertov for a stimulating discussion on an issue relevant to Judaism in contemporary society. Bring your questions; he has answers! Make new friends as you meet for dinner and socialize. Dinner is separate checks. Please contact Bunnye at 602.371.3744 for location and to register. Join NowGen for our Happy Hour Series! NowGen Ladies: Hop over with us to the Woman’s philanthropy “The Power of You” Event. Dr. Linda Benaderet and two guests share information and inspiration about breast cancer awareness. The evening continues with laughter, togetherness and gratitude. $18 includes dessert – dietary laws observed. 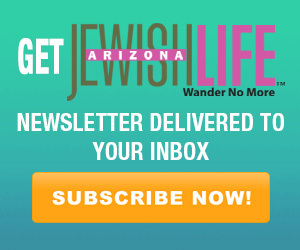 Register at jewishphoenix.org/thepowerofyou. We are very excited to host a Shabbat Dinner for Jewish Seniors! The Shabbat Dinner is open to Jewish Seniors and their families and to Smile On Seniors volunteers and their families. Enjoy homemade pastries and warm conversation on a variety of interesting topics led by Chani Levertov. Free event for seniors. Shabbat preparation Challah bake at The J. Registration required. Pumpkin spice and everything nice. Fall inspired beverages, bobbing for apples, s’mores and more! Everyone welcome!